Medicine is going through changes that include: technology, payment, insurance coverage, and even we’re told what medications we can prescribe. Physicians and patients often feel left behind. However, the doctor-patient relationship is still the key to good care and something doctors can influence. I’m your host, Dr. Maurice Pickard, and you’re listening to Book Club on ReachMD, and with me today is Dr. Bob Baker. Dr. Baker has had a long career as a gastroenterologist and also a professional magician and ventriloquist. But today, we’re going to discuss his new book: The Performance of Medicine: Techniques from the Stage to Optimize the Patient’s Experience and Restore the Joy of Practicing Medicine. Thank you, Dr. Baker, for joining us today. And thank you, Dr. Pickard. It’s a pleasure to be here. To begin with, so that we don’t confuse our audience, how do you use the word “performance” in the context of a doctor-patient contact? I think it’s important to first define what we mean by “performance.” Many people think of Celine Deon singing onstage or a comedian getting up and telling jokes or an actor on the stage, but I would like to refer to Erving Goffman, who was the probably the preeminent sociologist of the last century, and he wrote a book called, The Presentation of Self in Everyday Life, in which he said that we all have many different cells that we call upon under different circumstances. So, for instance, when I’m in the office, I am my doctor-self. When I’m with my kids, I have am my parent-self. They’re all genuine parts of me, just different aspects of my personality. And Dr. Goffman went on to say that a performance is any activity undertaken by 1 person in a given circumstance to influence or have an effect on other people who are in that circumstance. In other words, anything that we do to try to influence other people can be, or is, a performance. Let’s find some examples of that. When a lawyer—and goodness, I hate to use lawyers as good examples when we’re talking to doctors, so I hope your audience will forgive me—but when a lawyer presents a closing argument to a jury, he is giving a performance. Even without going into histrionics, he is trying to be convincing and authoritative and genuine to that jury. Or, when a pilot comes on to make a preflight announcement and speaks in a reassuring, authoritative tone or voice, that is a performance. And all of us have performing experience. It doesn’t matter whether you are in your 5th grade play in high school or you’ve offered a toast at a wedding or a eulogy, all of those are types of performances. And I realized some time ago that when a doctor goes in with a patient, that is a performance, and the role that the doctor is playing is his or her doctor-self, which is, as I said, different from our parent-self or our going-out-to-dinner-with-friends-self. And if we can become conscious of the fact that we are doing a performance, then we can use the skills that performers use to connect with our audience, which in this case is an audience of one, the patient. And so you do use the word “audience,” and I can see in the context you’ve just described how that holds true. You know, with all of us getting surveys every time we turn around, how does this, do you think, improve the patient’s satisfaction in his relationships? I mean, patients want, they need, they expect, and we’re being given surveys, or they’re being given surveys, all the time. How does this ability to transmit a performance to them help with their satisfaction? How does this, maybe, even affect the outcomes that our patients may have from our contact? Well, first of all, we do know that patient experience affects outcome. Studies have shown that it can affect things such as hospital readmission rates, medication compliance and even mortality, so the patient experience, and giving our patients a good experience, is very, very important. Now, as far as what the patient gets out of it when we give a performance, let’s think about what patients want when they go to the doctor, and it’s basically 3 things. First of all, let’s put aside the idea that they want excellent medical care. They want accurate care. They want us to know what we’re doing. I think every patient who goes in with a physician assumes that the physician knows what he or she is doing. So, the quality of care is there. Let’s give that as a given. But what patients want from the encounter is they want us to know them. They want us to listen to them and to respect them, and they want us to give them enough time. These are the things that come out in survey after survey. And we can use some of the techniques that performers use to connect with an audience to connect with our patients, to satisfy those wants and those needs. Let me give an example. Our patients want us to listen to them and respect them, but how can we show our patients that we’re actually listening, especially when we’re sitting at the keyboard and entering information into the EHR? It’s very difficult. So, one of the techniques that I describe in the book, which is full of techniques, is something called the triple-nod, and that is that as you are listening to a patient, slowly nod your head 3 times. This unconsciously transmits to the patient the idea that you are actively listening. What’s even more interesting is that if you tilt your head to your active listening side, as you nod 3 times, that conveys empathy. But the best part of all is that it also makes us, as doctors, feel the empathy. It requires us to be in the moment with the patient, to really pay attention to them, and patients pick up on that attitude and on that body language. So, that’s just 1 of many techniques that can help give patients what they want. Let me, if I may, outline another one. Lots of times when we go in to see patients, we’re standing up when we see them. We really should sit down. If we do so, that gives patients the impression we’re spending more time with them. Researchers at the University of Kansas did a study where they had doctors go to the bedside of postoperative patients, and the doctors were randomly assigned either to stand or sit while talking to the patient. And then they asked the patients to estimate how much time the doctors had spent with them, and the patients consistently overestimated the amount of time that the sitting doctor spent by about 40%, even though the doctors who sat clocked less time with the patients than the doctors who stood. So, if we go into the room conscious of these things, if we add techniques like this on top of our already good bedside manner, we can give our patients a better experience, and, I’d like to add, enjoy it more. We’ve been talking about the patient and the patient’s satisfaction, but the other part of the equation is the physician, the medical caregiver. It could be a nurse as well, but we’re talking about physicians. And you’ll hear all the time, when I’ve discussed about empathy, “I’m not an actor. I don’t have these skills.” But is that really true? Don’t we all have these skills? We just have to become aware of them? I maintain that the best doctors are doing performances whether they realize it or not. You had mentioned a story in which you picked up the phone to talk to a colleague and that your kids mentioned, “Oh, Dad’s using his “doctor voice” again.” And you didn’t even realize that you were doing it. And I maintain that all of us have our “doctor” persona, which we bring into the room with us every time that we see a patient. But just as we go through our medical lives acquiring and building medical skills, why should we not also build patient experience skills? And so I maintain that what one does—all doctors, whether they know it or not—are doing a performance. By becoming consciously aware of it, by adding skills to their skillset, they go from it being unconscious to purposeful. And when it’s purposeful and and you know what you’re doing, it’s better for the patient, and the doctor enjoys it more. If you’re just tuning in, you’re listening to Book Club on ReachMD, and I am your host, Dr. Maurice Pickard, and joining me today is Dr. Bob Baker. 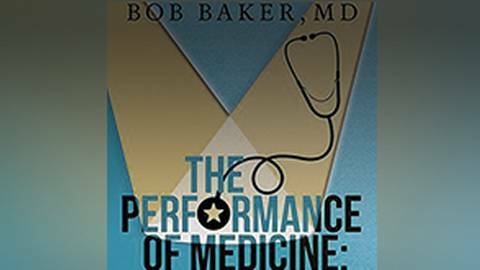 Dr. Baker is discussing his new book, The Performance of Medicine: Techniques from the Stage to Optimize the Patient’s Experience and Restore the Joy of Practicing Medicine. We talked about, and in your book you used the phrase, “It’s show time.” I remember as a physician years ago running a code, in the days when I ran codes, and then really being so exhausted I really wanted to go home and get into bed, but I had a whole day ahead of me of patients, and so I had to really become somebody that—I mean I had to really take some resources that I didn’t really realize I had. And I often use the phrase that you use, “It’s show time.” I remember in a movie called, All That Jazz, the leading actor, Roy Scheider, plays Bob Fosse, and after a very hectic kind of life that included drugs and other things, he would have to then become a director, and he said, “It’s show time.” I think every day physicians don’t realize that they are part—they actually are a medical instrument, and that instrument does have to perform. But, I’d like to ask you this. We’ve talked about patients. How does this really, what we’ve described… Doctors now, we’re hearing certainly about burnout, physicians wanting to leave their profession, not suggesting their children going into the profession, that they feel not valued, losing income, autonomy and respect. 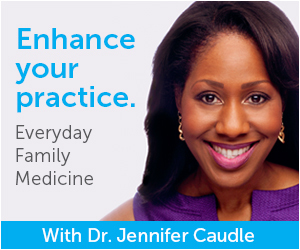 Do you think that what we have talked about can help doctors regain the joy that caused all of us to go into medicine? I absolutely feel that regarding it as a performance and giving your best performance as your best doctor-self can do that. You mentioned something very interesting about show time. I tell a story in the book in which I was seeing a patient for a routine blood pressure check, and I knew that she had a daughter with lissencephaly, or smooth brain disease, a daughter who was about 5 years old at the time, and mom came for her blood pressure check and told me that they had just had a terrible episode with her daughter in the hospital with aspiration pneumonia and uncontrollable seizures. She was in the pediatric ICU for several weeks. And her family was allowed to take her home, and mom said, “We know it’s going to be for the last time.” That was devastating. It was heartbreaking. And we hugged and we cried, and eventually, I checked her blood pressure. But I still had a whole day of patients in front of me. And, in fact, my next patient was a nice lady coming in for a routine physical, and she didn’t know what had gone on just before, and I was really devastated. I didn’t know how I was going to get through it. So, I stood outside the exam room door. I put my hand on the doorknob, and I stood up straight so that I’d have some energy, and I allowed a warm smile to come onto my face, and I heard myself say to myself, “Robert, it is show time.” And I went in there with an attitude, and I acted as if I was real glad to see that patient, and I felt glad to see her, and I acted as if there was no place on earth that I wanted to be more than in that room, and that’s the way I felt. And I was able to give her a great exam and also get through the rest of my day feeling good. Because one thing that actors and performers need to do is, when we go out on stage, everything else goes away and we dedicate ourselves to that audience and to connecting with that audience. And it’s having that performer’s mindset that can allow physicians to do the exact same thing, that you remember why you’re there, you remember who you are, and you become your best doctor-self for that one patient at that one moment, and you’ll realize that your giving that patient what brought you to medicine in the first place. Because for many of us, I really believe that we went into medicine, not only because we were interested in science or because we’re good with our hands and wanted to become surgeons, but also because we wanted to take care of people. That is a deeply important and deeply satisfying thing to do. And if every time you walk into that room you dedicate yourself to giving your best performance for that patient, it is deeply satisfying and just restores the joy of why we went into the field in the first place. It’s really, really sad that up to 90% of U.S. physicians would not recommend medicine as a profession. It actually hurts me to say that. I love what I do every single day, even with all the hassles going on with Managed Care, pharmacy, benefits, people, and demands for good ratings, all of that. When you think like a performer, when you have that performer’s mindset, you can put all of that aside. Go into that room and give the best of yourself to that one patient and that one moment. For me, that’s the performance of medicine. Do you really think—and I think you do from what you just said—that patients really remember how you, as a physician, made them feel during that encounter? They may not remember their cholesterol, their blood pressure, or that you even took it, that you didn’t examine them, but they will come back years later and will describe how the encounter made them feel. Do you think that really is the situation that exists? I do believe that, and I would like to paraphrase what Maya Angelou said, and that is, “Our patients will forget what we did, and they’ll forget what we said, but they will never forget how we made them feel.” And if people come out of that office feeling that you have given of yourself, then that is going to be much more important than what their blood pressure was or what medication you prescribed. It’s the human connection that makes medicine what it is, and as long as you remember that, we’ll never be replaced by robots or machines. So, what you’ve said, it sounds like physicians are all vulnerable, and the ability to communicate, our humanity, is really the response that seems to be most helpful to patients. That’s absolutely correct. Whom do we respond to best? People whom we regard as holding back from us, from withdrawing from us, or people who seem open to us? And vulnerability can be shown in many, many ways. It can be shown by reacting appropriately and emotionally to what a patient tells you, not to “act” a certain way but to take in what the patient says and allow your feelings to show. Vulnerability can be expressed in 3 very important words that every doctor needs to know how to use. Those 3 words are, “I don’t know.” It shows that we’re human. And of course, “I don’t know” has to be followed by, “But I’m going to make every effort to find out.” But by being human, we connect with our patients. One of the best ways to do this is what every good performer does before going out on stage. Think back to every single performer you have seen come out on stage. How do they come out? With a smile. I have seen so many doctors walk into the room with a business-like expression on their face, and I think that what we should do is, before we go into the room, we should stand outside for a moment and think about the patient we’re about to see as a good friend that we haven’t seen for a long time. Just let that feeling go through us, and a nice warm smile will come out, so that when you walk into that room, the patient knows that you feel genuinely glad to see them. You know something? We can do that even with the difficult patients, even the ones that we dread seeing. It’s amazing how much a smile can accomplish at the start of a visit, the feeling that you’re glad to see the patient. Yes, sometimes it’s more of a performance than other times, but it always connects with the patient. Before we leave, I’d like to just end on one note in particular that I felt was very impressive in your book is the concept of under-promising and over-delivering. How do you use that in your practice? That is one of the mantras of business, to under-promise and over-deliver. So, as a gastroenterologist, I was taking polyps out of people all the time, and I would always explain to them that it took about a week for the lab results to come back and that I would call them in a week. Now, sometimes the results would come back in just a couple of days. So, if I called them in 3 days instead of 7 days with a report that the polyp was benign, I had given them better service than they were expecting. That’s one simple example. Now, it’s very important, as I point out in the book, not to do the opposite. And my urologist over-promised and under-delivered. And let’s get personal now that we’ve been talking for a while. I had a vasectomy, and he told me that it was an easy procedure and the next day he had patients playing basketball. Really? Well, the next day, as I was lying in bed with ice packed between my legs and in a Percocet haze. I remember thinking to myself, “I want to meet some guys. Those are some real men.” So, we want to be careful that we make promises to patients that we do that. Another simple example, if we’re called out of the room, if we know we’re going to be out of the room for 5 minutes, say to the patient, “I’ll be back in 8 or 9 minutes.” If you come in in 5 minutes, you have under-promised, over-delivered. On the other hand, if you say, “I’ll be back in 2 minutes” and you come back in 15 minutes later, you’ve done the opposite. and that annoys patients. So, not only should we keep our promises, we should always under-promise and over-deliver to give patients a good experience. Well, I really want to thank you for that. I encourage everybody to look at this book and read this book by Dr. Bob Baker. It is The Performance of Medicine: Techniques from the Stage of Optimizing the Patient’s Experience and Restoring the Joy of Practicing Medicine. Remember, we all have to continue to listen, observe and respond to the patients who have given us the biggest compliment you can possibly give, that is entrusting their health to us. So, again, thank you very much for joining us today, and for those of you who have not had an opportunity to hear all our discussion, please be sure to tune in and listen to any of this missed discussion, which can be visited on ReachMD.com/BookClub to download the podcast and many others in this series. Thank you all for listening. Amid all of the changes in medicine, the patient experience and satisfaction are now more important than ever. Dr. Maurice Pickard connects with Dr. Bob Baker, author of The Performance of Medicine: Techniques from the Stage to Optimize the Patient’s Experience and Restore the Joy of Practicing Medicine, who shares his strategies and techniques that you should be implementing in your practice to boost the doctor-patient relationship.